Together, the Saint Louis Chess Club and the World Chess Hall of Fame form the Saint Louis Chess Campus. The Saint Louis Chess Club (STLCC) opened its doors in 2008 and soon became the new home for U.S. Championship Chess. Three years later, the World Chess Hall of Fame opened in 2011. Together the STLCC and WCHOF work to celebrate and preserve chess history as it happens in our community. Q Boutique, the gift shop at the WCHOF, offers quality chess merchandise, all-occasion gifts and thoughtfully-designed collectibles perfect for chess fans of all ages. Proceeds from Q Boutique support the WCHOF’s exhibitions and educational programs. Kingside Diner, a chess-themed restaurant located next to the Saint Louis Chess Club, offers a variety of early morning and late night food options seven days a week. In 2013, the Chess Club established the Sinquefield Cup, the first ever Super Grandmaster tournament to be held in Saint Louis. 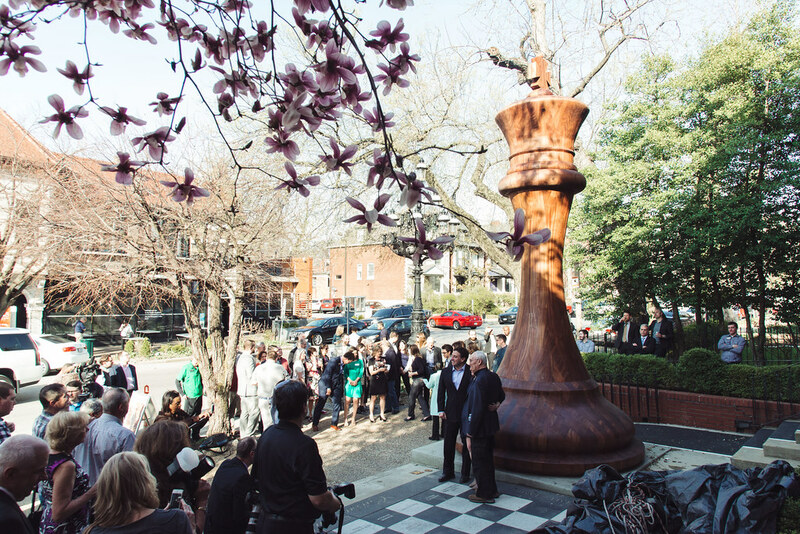 The 2014 Sinquefield Cup was the highest-rated chess tournament in the game’s history. The activities of the two organizations led the U.S. Senate to declare Saint Louis the Chess Capital of the United States in 2014. More than a century after the World Championship match in 1886, Saint Louis has again caught the attention of the national and international chess community. The success of the Saint Louis Chess Club and the World Chess Hall of Fame has received attention from the international chess community, making Saint Louis the premiere chess destination worldwide. In fact, the U.S. Chess Federation named Saint Louis “Chess City of the Year” in 2009 and 2011. The city of Saint Louis, however, is not without a lengthy chess heritage. In 1886, Saint Louis hosted a segment of the first World Chess Championship, which culminated with Wilhelm Steinitz defeating Johannes Zukertort to become the first World Chess Champion. Benjamin Foster, a Saint Louis resident and the editor of the St. Louis Globe-Democrat chess column, published Chancellor Chess: or the New Game of Chess three years later in 1889. His book introduced a chess piece called a “chancellor” and an additional pawn to an enlarged board. Although his proposal was ultimately rebuffed, it nonetheless received considerable attention from the chess community. The 1904 World’s Fair drew national and international visitors to Saint Louis. It also served as an occasion to hold the Seventh Annual Chess Congress in the city. Frank J. Marshall, founder of the Marshall Chess Club in New York City, was named tournament champion. Saint Louis resident and founder of the St. Louis Chess Club Max Judd was awarded the second prize. Another Saint Louis chess notable was Mrs. Eveline Allen Burgess, named Woman’s Champion of the United States in 1907. Samuel Burgess, husband of Eveline, was also actively involved in the local chess community. He served as the vice president and later president of the St. Louis Chess Club, of which Eveline was an honorary member. Eveline was also an active member of the West End Chess Club while Samuel served as its president. From the 1940s through the 1970s, Robert Steinmeyer was Missouri’s premiere chess talent, consistently winning the St. Louis District Championship. During that time, Saint Louis repeatedly drew grandmasters to the city for simultaneous exhibitions. Through the 1960s and 1970s, Reuben Fine, Larry Evans, Viktor Korchnoi, and Tigran Petrosian were among those who visited Saint Louis to challenge Steinmeyer and other local chess players. Breakfast all day is awesome. Kingside Diner is a new take on an American classic: delicious food, made to order and served quickly by a friendly staff that gets to know you and how you take your coffee. It’s a great place for breakfast—whether you eat breakfast at the crack of dawn, or late in the morning, or after a night on the town. We also have a complete menu of sandwiches, salads, shakes, snacks, and a variety of pastries & desserts made right here. Everything on the menu is available to carry out and you can place your order online before coming to pick it up. Q Boutique is the official online retailer of the Saint Louis Chess Campus. Q specializes in custom chess merchandise, WCHOF souvenirs, t-shirts, mugs, postcards, Sinquefield Cup collectibles and more. Visit Q Boutique—named Saint Louis’ Best Gift Shop by the Riverfront Times, Best Kept Secret by ALIVE Magazine, and Best Game & Gift Store by St. Louis Magazine—and find the perfect item for him, her, and kids of all ages. Our diverse assortment of all-occasion gifts pairs chic design with intellectual inspiration for a shopping experience unlike any other. Located at the the World Chess Hall of Fame in the historic Central West End, Q Boutique is a convenient jaunt from everywhere. We invite you to see why local tastemakers have made us their favorite destination when looking for something truly original to Saint Louis! Proceeds from Q Boutique support the exhibitions and education programs of the World Chess Hall of Fame. A perfect, large-scale version of a “Championship Staunton” king, the record-breaking chess piece was a joint effort between the WCHOF and the STLCC. A king piece measuring 20 feet tall (6.096 m) and 9 feet, 2 inches (2.79 m) in diameter at the base and weighing 10,860 pounds (4,926 kg). The piece is 53 times larger than its model—the "Championship Staunton" king custom-designed by The House of Staunton in 2013 for use in the first Sinquefield Cup—and is made of African sapele mahogany. This record was achieved on April 6, 2018. The World Chess Hall of Fame and Saint Louis Chess Club admit students and guests of any gender, race, color, national and ethnic origin to all the rights, privileges, programs, and activities generally accorded or made available to students at the school. It does not discriminate on the basis of gender, race, color, national and ethnic origin in administration of its educational policies, admissions policies, scholarship and loan programs, and athletic and other school-administered programs.